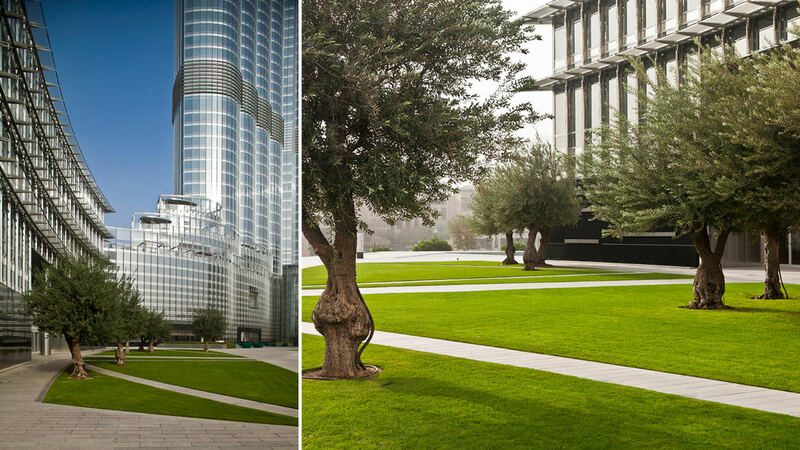 Playing on the theme of “A Tower in a Park,” this shaded landscape creates a compelling oasis of green, with distinct areas to serve the tower’s hotel, residential, spa and corporate office areas. 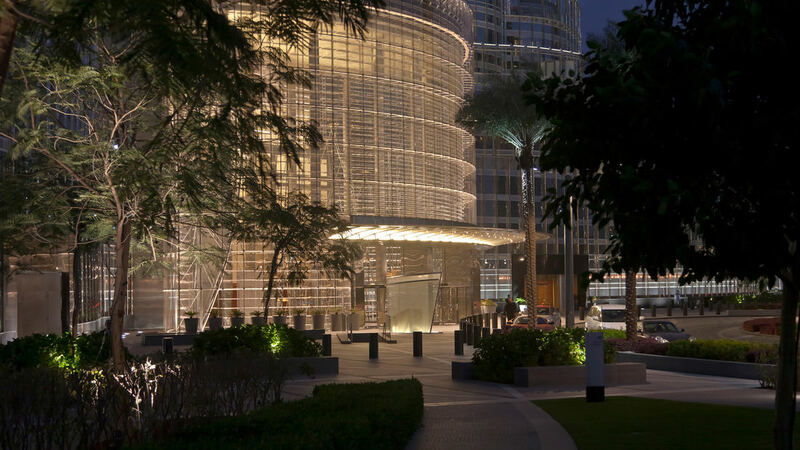 The visitor begins at the main arrival court at the base of the tower, where the “prow” of the building intersects a grand circular court—a “water room” defined by fountains, palms and park trees. From here, entry roads lead through the park-like landscape to separate hotel and residential arrival courts. 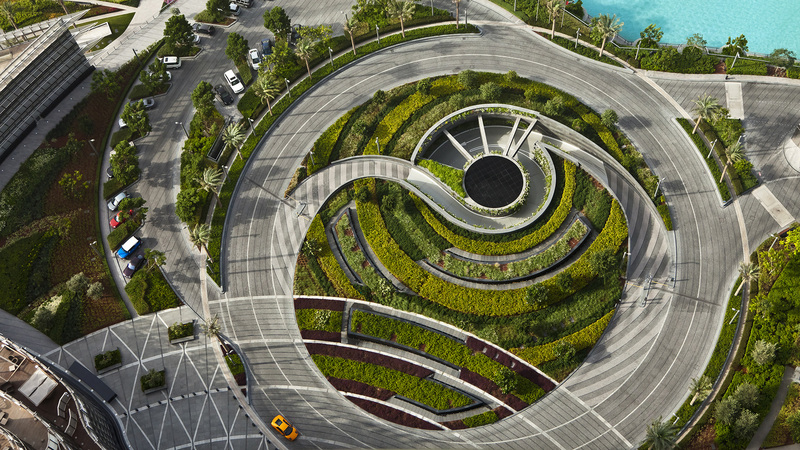 Vehicular circulation spirals down to garage level, while flowering trees and seasonal plantings, fountains, and distinct paving patterns establish a strong sense of place for each court. 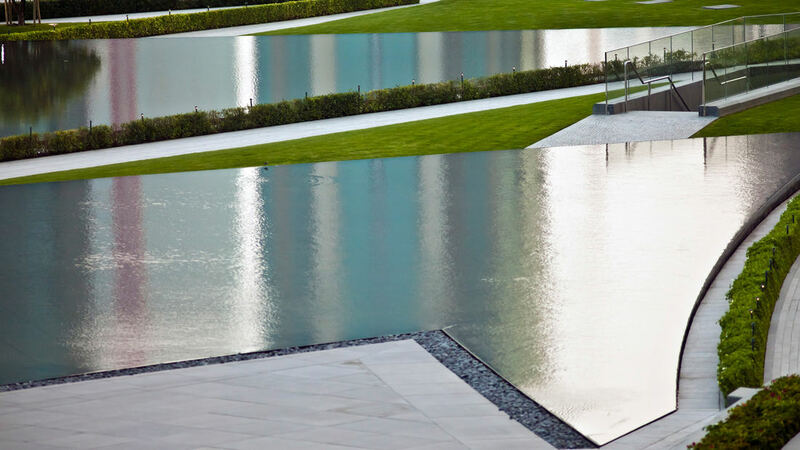 On the lake side, the Grand Terrace celebrates the scale and importance of the tower with a series of large reflecting pools that cascade from upper terraces to the lake itself. 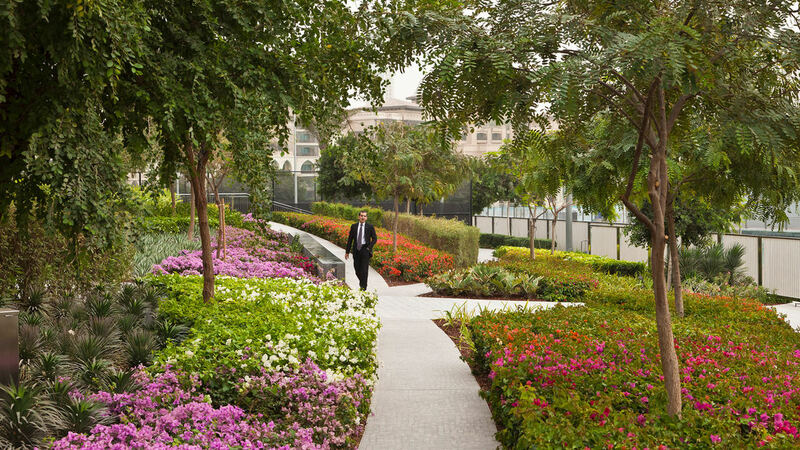 Comfortable walkways define the infinity-edge pools and invite a leisurely walk. 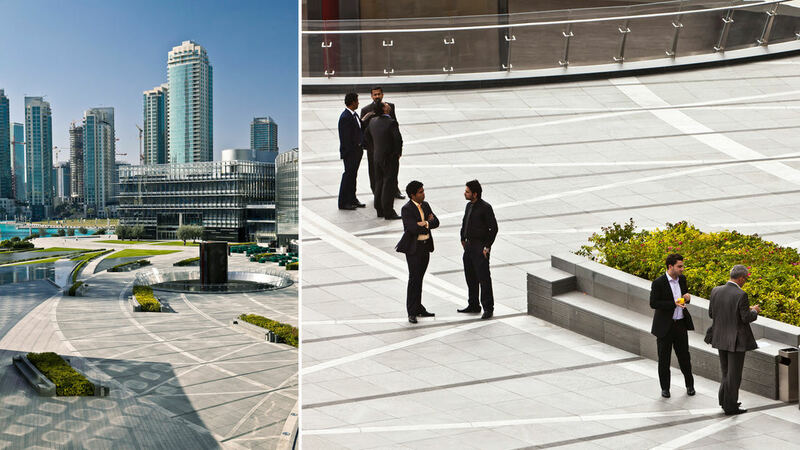 More direct walkways lead to the same connections, offering a variety of pedestrian routes to the Khalifa mall, Island Park, residential towers and hotels, and promenades that border the entire edge of the lake. 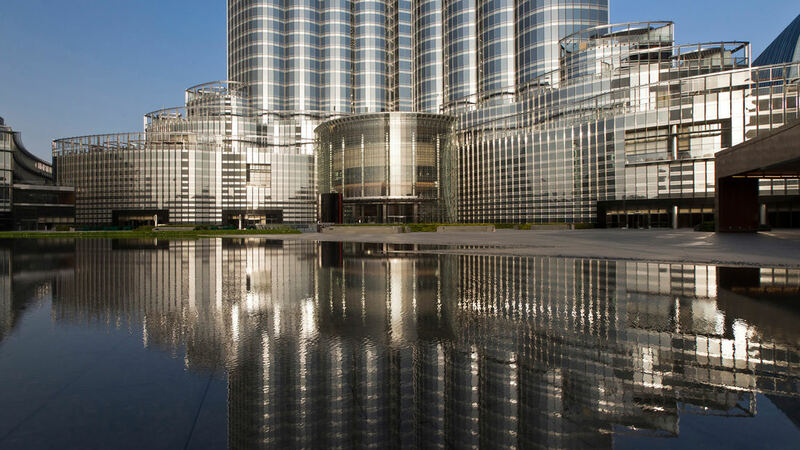 These outdoor spaces create a front door to the tower, serving the various uses and reflecting the building’s unique forms. 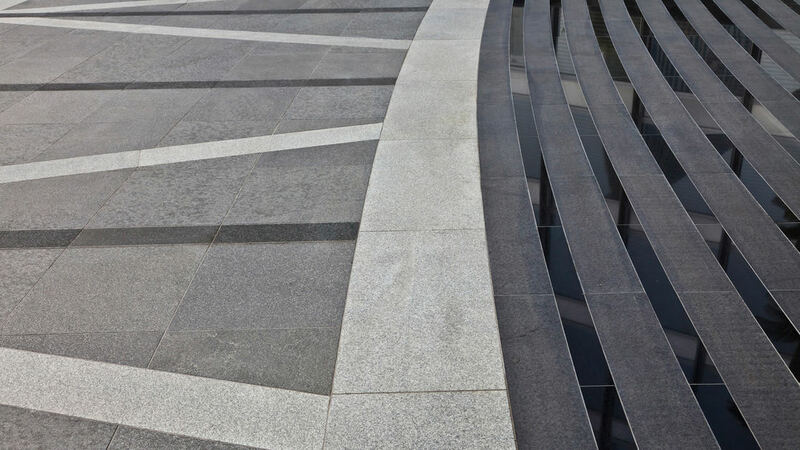 In particular, the plaza that encircles the tower expresses the key imagery of the hymenocallis, or spider lily, through an iterative pattern of banding including concentric and radiating arcs, criss-crossing lines, and a cool gray palette of granite to convey a feeling of comfort through the seasons. All site furnishings, from railings to benches and signs, incorporate the abstracted imagery of the spider lily and other patterns from nature, true to the historic traditions of Islamic architecture and design. Shade trees give comfort, and a rich plant palette of succulents, flowering trees, and other species suited to the area’s extreme temperatures create beauty, interest and character in the Tower Park landscape. 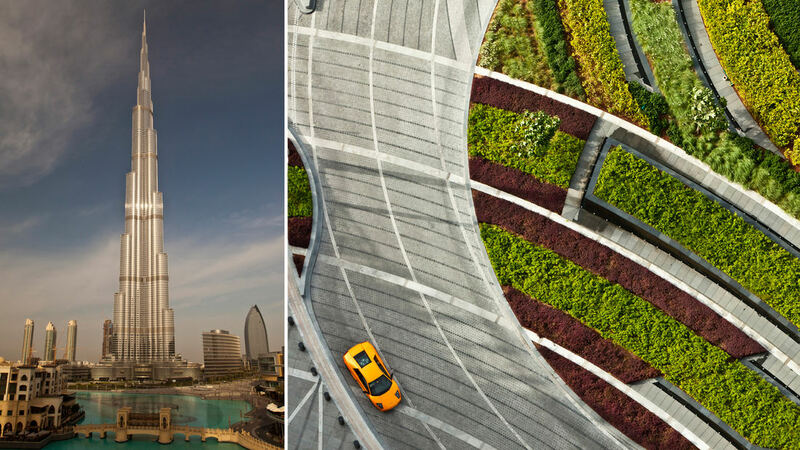 The region’s extreme climate offers unique opportunities for synergy between the tower and the surrounding landscape infrastructure. 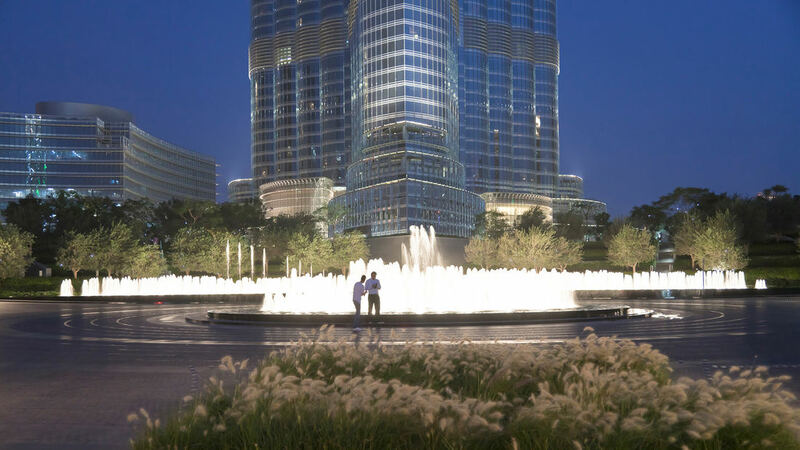 For instance, the hot and humid outside air, combined with the chilled water cooling system of the building, results in a significant amount of condensation. 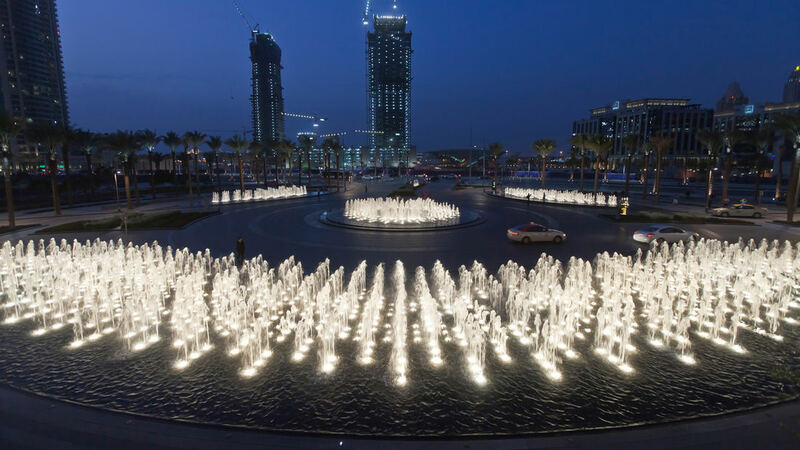 Every year, fifteen million gallons of condensed water will be collected, drained, and pumped into the site irrigation system for use within the Tower Park. 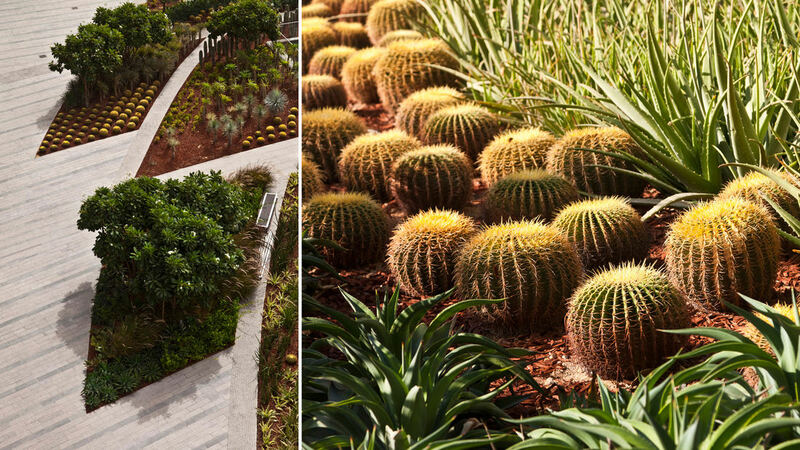 One of San Francisco’s first sustainable building projects, the California Academy of Sciences supports a stunning 2.5-acre green roof. Emphasizing habitat quality and connectivity, the project has received two LEED Platinum certifications.